St. Louis, MO (Law Firm Newswire) March 30, 2019 – Car Accidents are already complex lawsuits. Determining fault, the amount of the medical expenses that relate to the accident, and the amounts of recovery that can be obtained from the insurance policy versus the number of medical expenses that have to be covered add additional layers. But what happens when you add in poorly tied down playground equipment, a median wall, and two additional vehicles? In 2010, Wills was involved in a multi-vehicle accident that happened on I-270 in St. Louis, one of the main thoroughfares in the city. The accident was allegedly caused by improperly tied-down playground equipment falling from the back of a truck. Wills swerved to avoid the equipment that fell out of the truck but unfortunately still hit it. This impact caused her to collide with the median wall where she was then subsequently hit by two additional vehicles that were behind her. Wills was seriously injured in the accident and she suffered several different abdominal injuries as well as broken ankles. Gary pursued Concetta Wills’ case and held 4 defendants liable for their actions and insurance policies. Gary was able to collect the maximum allowable amount for the auto insurance policy of the driver of the truck, as well as the maximum allowable through the homeowners’ insurance. But how is that possible in a car accident claim? The playground equipment in the back of the truck was covered under the homeowner’s insurance policy. This means that when the equipment fell out of the vehicle and struck Wills’ car, the homeowner’s insurance policy then also became liable for the damages caused to Wills. Gary was able to establish this coverage and the homeowners insurance company was required to cover the damages. Court documents allege that the driver’s daughter was responsible for tying down the playground equipment but failed to properly do so, which subsequently resulted in the equipment falling out of the back of the truck and causing the accident that injured Wills. Gary pursued a recovery against the daughter as well for this alleged action. Gary was able to collect a $1 million homeowners insurance settlement and $250,000 auto insurance settlement from the mother, another $600,000 from the daughter, and a combined $75,000 from the final two defendants who drove the two additional vehicles that struck Wills. Here is a direct link to the article on Burger Law, as well as a related article from the Missouri Lawyer’s Weekly with the case number 11SL-CC00410/June 1, 2012. 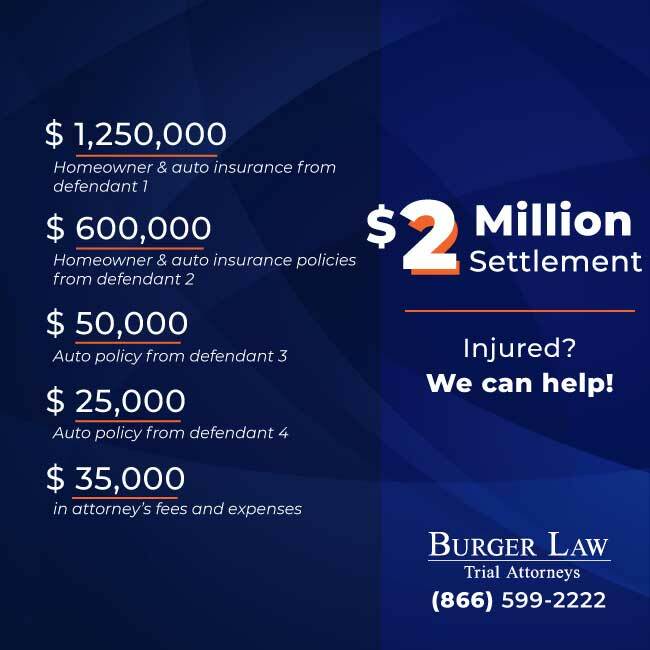 Gary Burger of Burger Law is a car accident lawyer in St. Louis who prides himself on fighting for the rights and recoveries of those who are injured by reckless and negligent acts. If you have any questions about this case call or contact Burger Law now at 314-542-2222 or 618-272-2222.